VPN is very useful and once I’ve had an account, I honestly can’t live without it. There are so many advantages for having a VPN account and here are some examples which I use a VPN for. Malaysian ISP throttles P2P BitTorrent downloads so using VPN is able to bypass that restriction. A lot of freebies are offered to US, UK and European countries so using a VPN allows me to grab the free license. Only allowed IPs can connect to my dedicated server via SSH so using a VPN service that provides a dedicated unique IP address solves this problem. Encryption when surfing the Internet using a public Wi-Fi to prevent sniffing and also FireSheep attacks. Access block websites and also contents such as streaming full videos on Hulu, CBS, Netflix and etc. VPNs can also help to load up a web page faster when your ISP is having routing problems. Last but not least, you will be anonymous during surfing the Internet and the websites that you visit can’t see or know your real IP address. I was contacted by Sergiu from CactusVPN to review the VPN service offered by their company. CactusVPN is a new company that provides VPN service which started operating early this month. Unlike other popular VPN companies, CactusVPN only has servers in three countries which is US, UK and Netherlands which in my opinion is sufficient. The US server allows you to stream full episodes in CBS, Hulu, Netflix and etc. The UK server can be used to watch BBC iplayer, ITV on Demand, 4oD, Zatoo and other British TV. As for the Netherlands server, it is used for torrents and P2P. I’ve had a HMA! Pro VPN account before which has servers in 40 countries but never really needed to connect to countries other than US, UK, and some European countries such as Germany and France. What I like about CactusVPN is I can connect to their servers using various methods. If you already have OpenVPN installed on your computer, you can simply download the OpenVPN configuration files from the client area and drop it to the OpenVPN config folder. If you cannot install any third party driver or software, you can use PPTP/L2TP/IPSec which is supported in Windows XP, Vista and 7. If you are confused by the installation and configuration steps, simply install their CactusVPN software. All I need to do is enter the user name and password then followed by clicking the Login button. Then I get to select which server that I want to connect to and the protocol (PPTP, L2TP, Open VPN). Clicking the Connect button and the manager automatically configures and connects according to the settings. 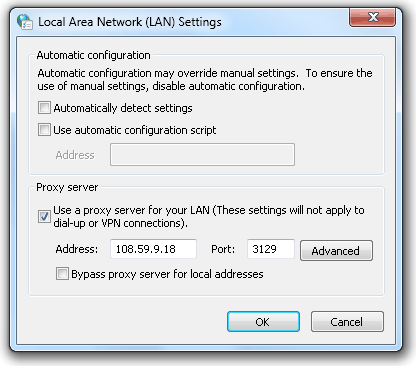 One of the unique feature offered by CactusVPN is proxy. This is very useful if you only want certain applications such as your web browser Firefox to go through their servers while leaving other applications directly connected via your ISP. Their proxy is of course password protected so you will need to enter the username and password you own from CactusVPN. 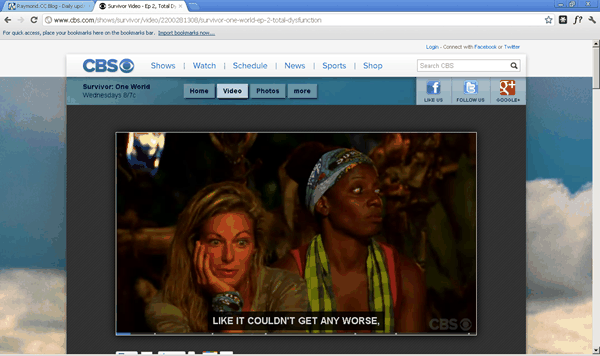 Upon testing, I am able to stream the latest full episode of Survivor from CBS without any lag or buffering problems. The Netherlands server also bypasses Streamyx filter allowing me to download at full speed. There isn’t any major slow down when surfing the web with any of their VPN servers connected. CactusVPN charges differently depending on the servers that you want to use. Their US, UK and Netherlands VPN cost $4.99 monthly each and offers further discount on longer subscription. If you want all 3 servers, then it will be $9.99 monthly. Head on to their Blog page where you can find their latest promotional codes. Unlike most VPN companies, you can sign up for a Free UK VPN at CactusVPN by clicking on the green colored TRY VPN FOR FREE button. The free trial VPN account is valid for 24 hours and anyone can sign up for it. My mother is a huge fan of the Survivor series and I think I’ll just subscribe the US VPN account for her to watch it online rather than going through the whole painful process of searching for the links, downloading, extracting, and playing the video file. Thanks for the article Raymond. VPN is good if you want to hide your real location. However, about content streaming, I prefer the DNS option. Currently, I am using UnoTelly and have no speed loss which allows me HD streaming with my 10mbps connection. Great article Raymond. The DNS option is better than using a VPN regarding content streaming because you can achieve direct connection with the media station ex. Netflix and avoid the “middle-man”. Personally, I am using UnoTelly which is similar to Unblock-us (or other DNS service). Perhaps you should check UnoTelly as well if you haven’t done so. I have Cactus but I can’t find that Proxy window of yours. How do I do it? Thanks. Thanks Raymond, this is just what I’ve been looking for. I couldn’t wait to win the free license, had to have it now! Does just what I wanted it to do! Been trying out Cactus VPN, in Win 7 64bit, with manually created L2TP VPN. Does anyone know how to force utorrent to just work only through VPN, and when VPN disconnects, that utorrent can’t work? how should that be setup in Firewall? Thanks Raymond for the Cactus VPN Giveaway. It sounds really great. Please count me in…thanks Ray! Would like a free account, thanks Raymond! I’M IN ON HIS ONE! THANKS! This is nice, so many times i needed to watch Hulu, but it is only for US. Good one!Hope to win!Good luck everybody! Very good list. Informative and Interesting.